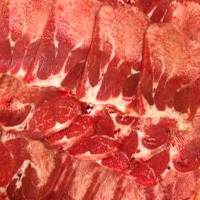 Beef tongue is the tongue of cattle that weighs about 1.5 kilograms on average. In Japan, cooking beef tongue is said to be a specialty of area surrounding Sendai. Beef tongue is sometimes found to make beef tacos. It contains more than 10 percent protein from collagen that is good for your joints and skin. Beef tongue ice cream won the Yokohama Ice Cream Expo in 2008. The calories in Beef Tongue per 100g(1cut ) is 269 calories. Beef Tongue is calculated to be 269Cal per 100 grams making 80Cal equivalent to 29.74g with 21.7g of mostly fat、15.2g of protein、0.1g of carbohydrates in 100g while being rich in vitamins and minerals such as Vitamin B12 and Niacin.